The melody is conjunct, and sung by the male tenor vocalist, who repeats the melody with every verse. The meter is in 4/4, and the melody is predominantly on quarter notes, with the embellishment being in the sixteenth or eighth notes as necessary. Some of the embellishment also comes along with the accompaniment. The harmony is provided by a simple accompaniment in the lute, which follows a pattern, emphasizing the beats, and changing pitches the last two beats of every other measure in the A section. In the B section, the pitches change every two beats and alternate between two sets of pitches. The melody is carried solely in the male tenor voice, and the accompaniment is a repetitive pattern on the lute. The form is strophic in nature, with little variation between verses. There are three verses in this recording, however the full song has 8 verses and a coda. Within each verse, the structure is A, A’, B. This piece is secular and strophic in nature, and is about the love of the singer for a woman he cannot have. 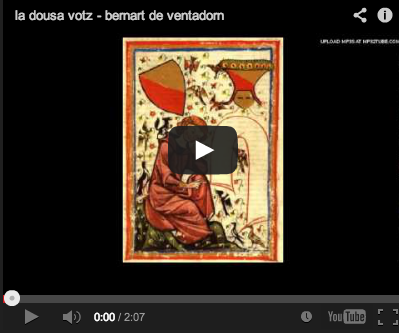 This song is by Bernart de Ventadorn, who was one of the first troubadour poets of the 12th Century. He served (and loved) the Queen Eleanor of Aquitaine, who was the wife of Henry II of England. This song was one of the first secular pieces written at this time, contrived for playing in court. The song is written in Provençal, which is the Middle Ages combination language of Old French and Old Spanish. 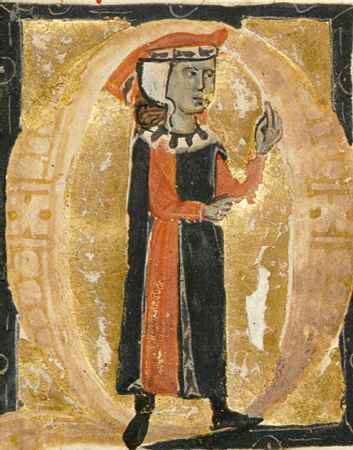 This is a medieval drawing of Bernart de Ventadorn. The purpose of troubadours and trouvères in France in the Middle Ages was to entertain the court. These singers played alone and were hired in long-term positions to serve royalty. These men, and even occasionally women, wrote poems and songs, which they either performed themselves or gave to jongleurs to play. This is recognizable in "La Dousa Votz" with the lack of a score written originally by Bernart de Ventadorn, though the original penned poetry exists. Though there are modern reproductions of this piece, it is impossible to tell exactly how it would have sounded in the Middle Ages when played for Queen Eleanor of Aquitaine. These are the lyrics of all eight verses, translated from Provençal to English (De Ventadorn, Bernart. "Translation"). l'autrui jois al meu damnatge. landas e pla e boschatge. qu'eu que n'ai faih lonc badatge. per costum e per uzatge. ni ja mais parlar no·n quer. que·m n'an faih dire folatge! c'om no·n pot dire folatge." joy that rises from outside. heaths and. plains and woodland too. if some base remark slips out. than am I, who've waited long. and no longer took my side. both by custom and by use. I departed from her rule. and within my heart I'm glad. if there were no slanderers. who've let me speak foolishness. no one may speak foolishness."